Picking Bloody Basin for our archery hunt was an easy decision. Although close to Phoenix as the crow flies, the poorly maintained forest roads and rugged country keep the masses away. Plus, Bloody Basin is classic coues country: high desert creosote scrub lands with plenty of juniper, mesquite, palo verde and prickly pear cactus. Bloody Basin is vast but the people are few. 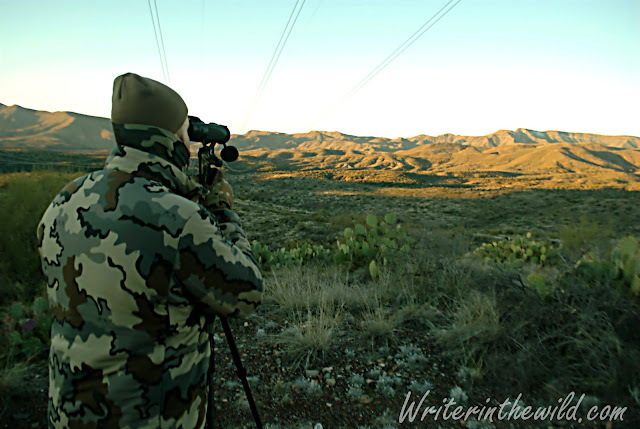 After last year's failed mule deer hunt in the Cave Creek region of Tonto National Forest, we resolved to do plenty of scouting this time around. Our scouts in Bloody Basin revealed lots of deer. Glassing opportunities abound in Bloody Basin, and we spotted groups of coues bucks on multiple occasions. One such group was a bachelor herd of around 5 or 6 young bucks. We spotted them bedding and feeding on the same hillside on multiple occasions. It was this group that would be the focus of our hunt. From our camp at Red Creek we reached a position to glass the hillside at first light. We immediately spotted two coues does feeding near the same spot where we spotted the bachelor herd in our scouts. Since it was now the height of the rut, we assumed that the bachelor herd would be split up, which seemed to be the case since we never saw any herds with more than one buck. We watched the does for most of the morning, and when they were bedded, decided to take a closer look. They were bedded on a hill just below a ridgeline. This ridgeline would prove to be the focal point of our hunt for 4 of our 5 days in Bloody Basin. The topography at this location was challenging because on the ridge was a mesa that could realistically only be accessed from two sides due to the giant cliffs that surrounded it. Early afternoon on the first day we spotted a large buck chasing a group of does at the base of our hill. It was the first time I've ever got to see a rutting buck, and I felt like I was part of something special having the privilege to witness it. We were chomping at the bit and the day was disappearing. We decided to put on a stalk. The wind was in our favor as Jim and I split up to find the buck. I climbed to the base of the hill while he stayed low, in the hopes that one of us would be in a blocking position if the buck spooked. I put on my best desert ninja impression. I walked carefully and deliberately. I glassed often. Jim spooked a doe. The sun set behind the mountains. We returned to camp. Day 2 was more of the same, minus the buck. We spotted a doe at first light feeding in the same spot we stalked the buck the night before. Thinking that maybe the buck was near but bedded down, we crept to about 130 yards from the wary doe. She eventually bedded behind a prickly pear in a thicket of juniper. We were in great position hiding amongst some junipers on an adjacent rise, and we watched her undetected from pretty close. I could have sat there watching her all day. Next morning the buck we were after skylined himself on the ridge at first light. Wasting no time we scampered up the backside like we had on day one. We were moving quietly and the wind was in our favor as we passed some old ruins from a time when Indians hunted these lands. I felt like we had a real chance of getting that buck. Unfortunately we rounded a bend and found our route blocked by a herd of grazing cattle. Since they weren't moving and our day was wasting away, we decided to just walk calmly by them. The huge cliff that I mentioned previously prevented us from taking a more circuitous route. As soon as the cattle saw us moving toward them they spooked. There were probably only ten of them, but they thundered up that hill straight toward the area we spotted the buck. We were too committed to the stalk to just give up so we continued moving forward, but inside I felt like the buck was long gone... and it was. Near where we spotted the buck from the valley to the left. That turned out to be the closest we ever got. Day 4 was spent glassing from sun-up to sun-down without seeing anything but a couple red tailed hawks circling overhead. Our buck was seemingly spooked for good. The morning of day 5 we switched locations all together. We had glassed 4 bucks scouting this new location and caught a 3x3 in a game cam (the other 900 plus photos were all cattle), so we were reasonably confident we would see some deer. The new location was farther south, and the terrain radically different and vastly more difficult to hunt. Catclaw (also called "wait-a-minute bush") covered this area. If you've never ran into catclaw in the desert before, count yourself lucky. It is one vicious plant. It was so thick that it literally stopped us in our tracks on more than one painful occasion. It ripped our clothes and our skin, and made any attempt at stealth impossible. Where there wasn't an obscene amount of catclaw, it was instead thickets of scrub oak, which really aren't any better. Surprisingly, we spooked a bedded buck from about 15 yards away. It shot like a dart across a field of catclaw bounding over the thorny vines like some kind of desert acrobat. That buck literally covered 100 yards in the blink of an eye. It stopped on a catlaw covered hill and hid behind a prickly pear. We glassed it for a few minutes while trying to formulate a plan. 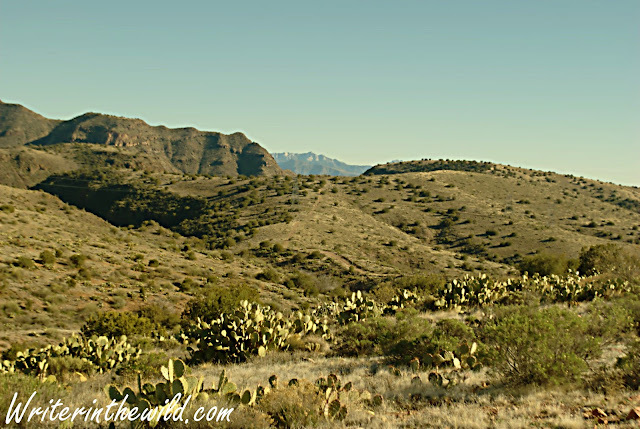 Because of the dense catclaw and scrub oak, by the time we reached the hill that buck was long gone. Jim and I on the last day. It's hard to tell but all those bushes behind us are the dreaded catclaw. Even though we came up empty handed, we certainly didn't come out empty headed. I felt like I learned a ton about hunting on this trip. If you follow my blog, you'll know that this is only my second hunt ever. From what I've read, hunting coues deer with a bow is considered one of the most difficult hunts in the world. Maybe I was little too ambitious in planning this trip, but frankly, I still feel like I could have got one. I feel like I have what it takes. More than anything, it's about putting in the time, which is what I just don't have a lot of. This may be my last coues deer hunt ever as I am moving to Oregon in the Spring. That little whitetail taught me a lot in those 5 days, and I hope to carry on the knowledge... By the way. In 5 days of hunting in Bloody Basin we saw a grand total of 3 people, and none of them were hunters. We had the place to ourselves.